"We have tried many other cable brands for both our Electric Harps and our Acoustic Harps and nothing comes close to the quality of our Mogami cables. It's important to us that the sound of our harps is true and clear. Mogami cables are the most transparent and noiseless musical cables we have found. We never go on stage or record without our Mogami cables." 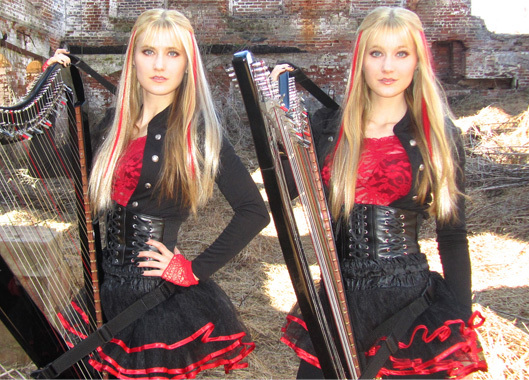 Young harpists Camille and Kennerly Kitt, known as the HARP TWINS, have achieved extraordinary success by taking Electric Harps and acoustic Concert Grand Harps to unprecedented levels and smashing boundaries between different genres of music. The duo has amassed over 700,000 fans across their social media sites and over 35 million views on their YouTube music videos, making Camille and Kennerly the most followed and recognizable harp duo in the world. Mixing their virtuoso harp skills with their stunningly complex arrangements of rock, metal, and soundtrack hits, the Harp Twins deliver exciting and interactive performances audiences cannot forget!